If you’re looking to get yourself a new home theater, then you’re probably looking at a ton of different brands that are on the market. It can be really difficult to know what the best option may be for you. Two of the most popular brands on the market are Sonos and Bose – two brands that are both known for producing some awesome audio equipment. Deciding on a Home Theater system is not a decision that you’ll want to take lightly. Both Sonos and Bose are good options – if you want a prestigious brand, you can opt for Bose but you shouldn’t discount Sonos too easily – they produce some of the best home theater systems on the market too. If you’re struggling to decide between the two, then we’re going to run through some of the differences between the two so that you can make an informed decision on which is the better option for what you need. Lets take a look at the two brands histories, then we can have a closer look at the pros and cons of each brands. Do Bose even need an introduction? They are one of the best known brands within the industry, and their brand really speaks for itself. Though they are probably better known for their headphones than any other product, they also offer a ton of other products as well. Bose are also known for their stereos and definitely for their Bluetooth speakers. Sonos are nowhere near as old as Bose in age – they were only started in 2002. But, this doesn’t mean to say that their products are not as good as Bose products. In fact, Sonos were started to try and fulfil a gap in the market and they’ve done it well – the company has seen growth year on year since it was started. There are some undoubtable positive of using Sonos speakers throughout your home, and you should definitely consider this set if you want something for your home. 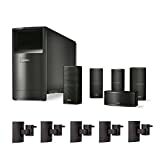 The set I’m looking at in particular are a good option; it’s the 5.1 Playbase set from Sonos. 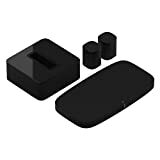 With this set, you get their Playbase, a subwoofer and two of the Sonos Ones – their more popular smart speaker that you can easily set up in your home. One of the benefits to this is that you can integrate this home theater system in easily with Amazon. This means that you can use it easily with Amazon Alexa. The Sonos One produces sounds that are a million times better than the Dot or the Amazon Echo, so you should consider that if you watch a ton of films in your lounge and need a good sound system. The Sonos Sub is also extremely good quality, and it will create some awesome deep sounds. Along with the Sub, you of course get the Sonos Playbase. It plays down to around 25 Hz, which is what you need from a decent subwoofer. The Playbase features 10 amplified speaker drivers, which helps to create a really powerful sound coming from your system. It’s really easy to control the treble and bass on your sound system, so it won’t be difficult for you to get the sound settings you need. If you’re looking for another of the better home theaters, then you want to consider the Bose Acoustimass. You will get a far more complete sound system with this one than the Sonos, and if you shop around, typically it’s a little cheaper too. If you want to make things easy for yourself, you’ll want to take all of the speakers out of the box before you start to set it up. This will make it a lot easier for you to set it up, and you won’t get confused with all the different wires. I’d advise getting the set with wall mounts, as this means that you can set the speakers up around your TV mounted on the wall. They are some good quality speakers, and you’re sure to get a decent sound from them. If you want something to watch movies with, then this is undoubtedly one of the best options for watching films. There are a couple of things that you’ll want to consider about the Sonos Home Theater System that may effect whether you end up purchasing their products or not. Firstly, the main issue with the full Sonos set is that it’s particularly expensive. Unless you have a significant budget for your speaker set, this isn’t going to be the best option for you. It’s not a budget set, so bear that in mind before your purchase. Secondly, another thing that you should consider is that it isn’t able to be integrated with Google until 2019. This was originally meant to be released in 2018, but it’s since been pushed back. So, if you want something that you can use with Google, this may not be the system for you (yet!). The Bose Acousticmass set is awesome, and there aren’t a lot of negatives about it to mention. The two things that spring to mind are that the quality of the Bose sound system isn’t quite as good as the Sonos System. It’s also not the most attractive set up, though this doesn’t seem to bother the majority of people looking for a home theater system. Overall, it’s difficult to pick between these two brands if you’re looking to set up your own home theater. Whilst Bose are undoubtedly the most prestigious of the two, this doesn’t mean to say that you should completely discount Sonos. Typically, you can find a Bose sound system a little cheaper than Sonos – this is mainly because they have a wider variety of products, so there are undoubtedly difficult scales of speakers that you can choose. You don’t get that option with Sonos, and if you want the full range you’re going to have to pay for them – though they are worth the price.